Space Chickens in Space Set to Engage in Some Animated "Fowl Play"
Move over “Pigs in Space”, because you have some stiff competition in the whole space-faring animals category. 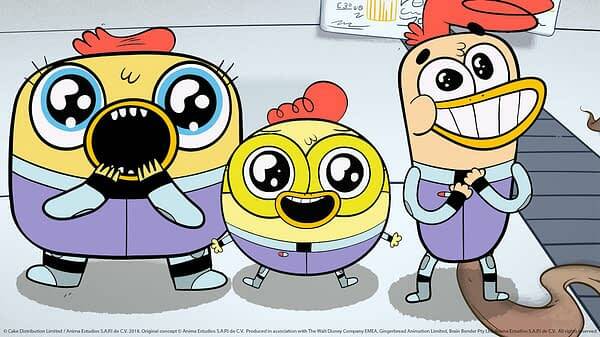 British production company CAKE, Australia’s Studio Moshi, Mexico’s Ánima and Ireland’s Gingerbread Animation are teaming-up on new children’s animated comedy series Space Chickens in Space. Created by José C. García de Letona and Rita Street, with Jordan Gaucher serving as showrunner, the first 52-episode season is commissioned by Disney EMEA, Disney Australia and Australia’s Channel 9. Designed and directed by Norwegian animators Tommy and Markus Vad Flaaten as a series of 11-minute episodes, Space Chickens in Space (which though while redundant, does an excellent job of clearing up any confusion there might be that the Space Chickens are in a Trader Joe’s or something) tells the story of three chickens who are mistakenly taken from their homes and enrolled in an elite intergalactic former military academy. The siblings need all their wits and each other to survive in this world full of aliens and tricky homework challenges. With production starting this week and an expected late-2018 premiere date, Space Chickens in Space is aimed primarily at 6-11 year old children. It’s an animated 2D co-production between Ánima, Studio Moshi and Gingerbread. CAKE, the London-based independent production company specializing in children’s and family programming, is handling all international distribution outside of Latin America and Australia; with Ánima handling distribution throughout Latin America and Studio Moshi responsible for Australia. A Interview with the directors of #SpaceChickensInSpace @MarcyVF & @TommyV. Unfortunelly This Is Norwegian But We Traslated It!